This is more of a beginner post than I would usually write, but several friends at Indy Hall and around the Philly start-up community have been asking for a while, so I decided to write it. The goal of this post is to provide a simple, straight forward, and step-by-step guide on how to approach optimizing a page on your website for your target keywords. Time-frame: Depending on the volume of content on your pages, this will probably take you between 1-2 hours your first time. You will become exponentially more efficient, but for the first time plan to set aside a couple of hours. 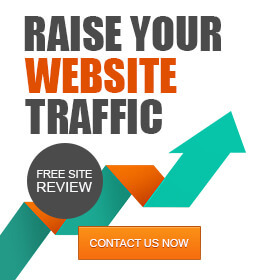 My hope is that you will be able to take this approach and replicate it over and over again for other pages on your site, to begin to build the content ecosystem you will need to achieve high rankings. In order to make this post as useful as possible, I am going to run through the research process using a target keyword suggested by Alex Hillman that I know nothing about. I am going to start this process the way I would for any new industry vertical where I have no prior SEO experience or knowledge. Furthermore, the keyword Alex suggested is a one word head term with Wikipedia in the #1 spot. So this strategy is not going to get him onto page 1, but these recommendations will allow for anyone to at least get started with on-page optimization. The keyword I will be using for this exercise is Coworking. 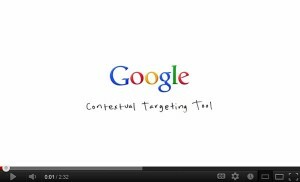 In order to identify your target keywords you need to do a bit of research. 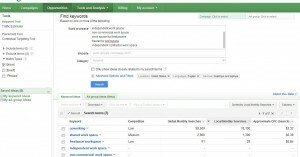 You should have in mind the user intent when searching with that keyword, and optimize your SEO strategy accordingly. Next click the ‘Download’ button and select ‘All search results,’ from here you can export into any one of the standard formats for data – I prefer CSV for Excel. I pull all the keywords into excel so I can sort the suggestions by local search volume in descending order and begin to weed out the terms that make no sense. Please note that the above competitive index is based on bid pricing and activity within paid search, and is not an accurate representation of the keyword’s competitiveness within organic search. 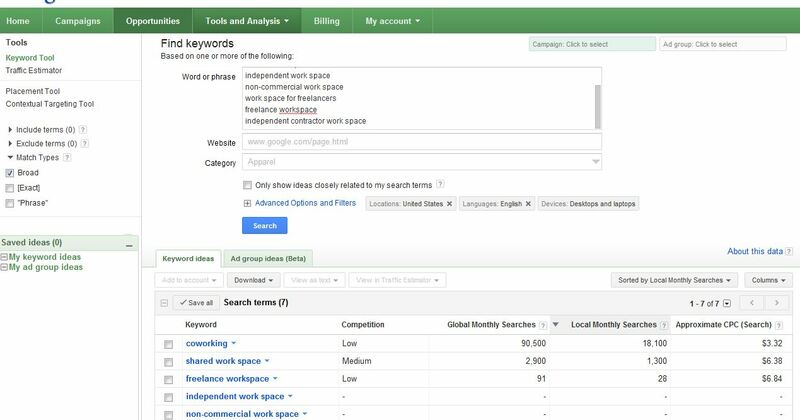 To properly gauge organic competitors for a target keyword you need to analyze many attributes of the current ranking websites by conducting a full-scale SEO competitive analysis. What comes next is some simple grouping and prioritization, essentially we need to split these words up into chunks so we can write about them. I find this easiest to do by visually scanning the words (this isn’t always feasible, but since there’s only 30, it’s not a problem) and pulling out what would make good H2/H3’s to break the content up into digestible chunks. If you don’t know what an ‘H2’ is yet don’t worry, I’ll get to this. So now that you have an idea of how to structure some of the content on your page to target keywords, you need to identify some closely-related concepts to bake into your paragraphs to keep your keyword optimization contextual. 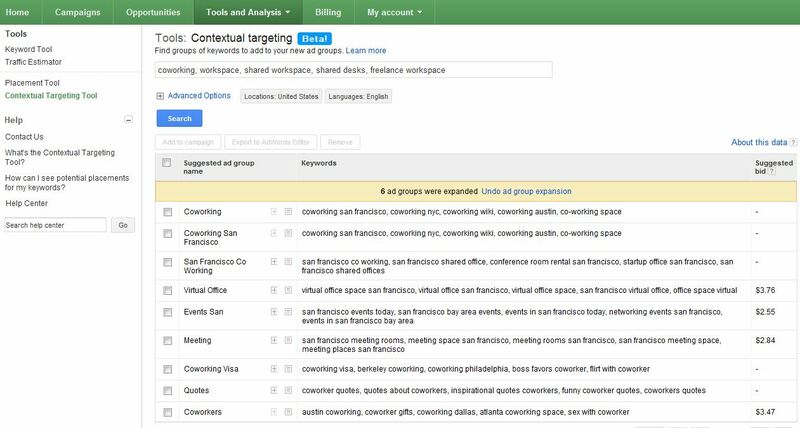 Using the Contextual Targeting Tool you can enter up to 10 keywords, separated by commas, and the tool will spit out suggested Ad Groups, many of which you can expand, expand, expand. The power here is that Google is showing you what it sees as contextually relevant words within these top level keywords groups; Win! As you can see some of these suggestions are not useful; coworker flirting, annoying coworkers, coworker gifts, etc. but some of these suggestions can be easily used to expand on concepts within your page while staying within Google’s good contextual graces, such as: meeting rooms, coworker appreciation, collaborative workspace, etc. Once you’ve written content that makes sense and provides useful information to your reader, then go back over it and look for opportunities to use your keywords but don’t force them. Nothing is more awkward then keyword-stuffing, and search engines see this as a form of spam anyway, so avoid it at all costs. Instead find places where you referred to this, that, its, or other words where your target keyword is actually beneficial as a reference point. People will call these all sorts of things, but I prefer to refer to them as meta attributes or elements. What I am essentially talking about are the pieces of your web page that are written almost exclusively for robots search engines. I say almost exclusively because your page title and meta description are also extremely important to humans, but things such as your header tags, alt tags, and internal links are going to be mainly for the benefit of the search engines. Your page title is widely considered the most important search engine optimization and conversion optimization element of your page. This is given a heavy weighting signal by search engines and is also the first thing a searcher is going to see and read within Google or any other search engine. For both of these reasons your page title must contain both your target keywords and incentive for the searcher to click, all within 60 characters. Write your descriptions the same way you would write a short summary as a teaser, don’t just list keywords and phrases but instead try to boil down the value of the information in your page to a concise teaser that will entice search engine browsers to click-through to your page. Header tags which range from H1 to h6 provide an HTML hierarchy for the copy on a page. Each and every page on a website should have a unique, keyword focused H1 and then use h2-h6 tags as needed to break up the organization of other ‘sets’ of content. For example you can look at the structure of this post, right now I am writing under a section called header tags, which is an h4, but underneath (within) the “Designing Your Meta Attributes” section which is an h3; meta attributes contains header tags. I am going to say this again because it does confuse some people, header tags are a hierarchical structure for the content on your page. Also, an important note, pages should only ever have ONE H1 tag, but can generally have unlimited h2-h6’s although as with optimizing any experience; use in moderation. Alt text is probably most useful for images although I also recommend using it for links. Even though you may believe Google and other search engines can see images, and to some extent Google’s image recognition software is pretty sophisticated, search engine crawlers are looking first at the alt text set on the image and then at the content surrounding the images on the page to determine their context. For an image tag the alt text is specified right in the call for the image, so <img src=”http://yourwebsite.com/uploads/some-picture.jp” alt=”This is the alt text or image description“/> I realize many of you reading this probably add images without ever seeing a line of code, for you this is usually offered up in a text field when you add the image and may be called alternative text, alt text, or even description within some content management systems. For links it’s almost identical, with the alt text living right within the <a> tag, so for example <a href=”http://somewebsite.com” alt=”This is the alt text“>some anchor text</a> in addition to providing this for search engines (which likely adds little to no value) this does provide a description for visitors when they mouse over the image or link. This is becoming a reoccurring theme in this post but don’t stuff your keywords in here either; use them but in the way you would to describe the image or link to a friend if you only had 3-7 words to do it in. Internal links are exactly what they sound like, these are links on your website to other pages on your website. It is crucial to bake this architecture into your pages to relate content and concepts between pages and also send link-juice flowing from one page to another. In the old days, before Penguin and over optimization, I would have recommended to always use your target anchor text for internal links. But oh how the times have changed. I would now recommend to instead focus on identifying phrases within your existing page copy where it makes sense to link out to other related content on your site. An example of this would be if I were writing about improving your website with Google website optimizer, see what I did there? While you’re off to a great start, on-page optimization is one small piece of the SEO pie. There are larger site wide SEO contributors that you need to also look at like architecture, speed, security, domain age, web host, and more. But chances are you are already off writing blog posts, so hopefully this can at least help you optimize your post content for the keywords you are targeting for search engine rankings. 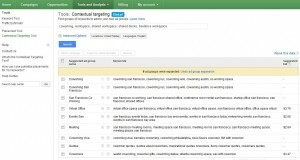 In addition to getting everything on your site optimized, you need to begin optimizing off site. Off-page SEO really boils down to building links relationships and social outreach. Now I am by no means a link building expert, but I will say this, gone are the days of building links just for the sake of building links. With the recent Panda and Penguin algorithm updates Google has pushed out, now more than ever before you must think about the purpose of each link and pay close attention to the links you receive. It has been speculated that Google is now attributing more authority to links that send traffic versus those that do not. Personally, this makes sense to me; natural links that are of value to website visitors are usually citations used for editorial purposes, and tend to send traffic to the destination URL’s. If you know of a good source that reports on this topic please add the link in the comments and I will update this post to include the link and a link back to you. Wow, you made it through this giant post. SEO is a diverse science filled with many many aspects that ultimately impact your content’s ability to rank well in the search engines. Hopefully this post has at least helped you to wrap your head around the basics of building content on the pages and within the posts you are attempting to rank. If you found this post helpful, got any value from it whatsoever, or think it sucked and would like to share the long list of reasons why, please do so in the comments.